Nature abounds in these 600-plus acres of native Florida foliage. Tiburón's championship golf courses are among the nation's most sophisticated and alluring. Norman designed Tiburón to play like a British Open Links course, firm and fast, but without the frustrating thatch of rough that confounds even the professionals. Tiburón reflects Norman's appreciation for pristine natural settings...and his passion for great golf. Members and guests share the beauty and grace of this spectacular course, which was designed to dramatically enhance its surroundings. Each distinctive element has been carefully integrated to produce a pleasing atmosphere in which to cherish the finer aspects of the game. 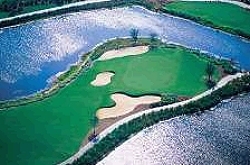 Golfers appreciate a challenge like no other, while enjoying the unique course features such as stacked sod wall bunkers, orange/red coquina shell waste areas, and no rough to protect errant shots. With five sets of tees on each hole, Tiburón is the preferred choice for golfers of all skill levels. Admired for his exceptional charisma and business acumen, Greg Norman is an athlete of tremendous talent and undoubtedly one of the best-known and respected sporting personalities in the world. Norman's record on the golf course ranks him among the world's best. Included in his achievements: 79 career victories, three-time Vardon Trophy winner, two-time British Open winner, PGA Player of the Year, three-time recipient of the Arnold Palmer Award for Leading Money Winner. These are a few of the reasons WCI Communities selected Greg Norman to design Tiburón's two courses. The Tiburón courses are Norman's twenty-ninth course design in the world, his seventh in the United States, and his most challenging golf course design yet. "One of the true marks of a quality golf course is its playability from all tees," said Norman. "Since the golf courses opened several years ago, I have received a lot of positive feedback from members and guests on how the golf courses play. Now, with the Franklin Templeton Shootout calling Tiburón home, the best players in the world are finding a great challenge. We're happy with what we created and glad that presents an enjoyable test regardless of skill level." Norman's design philosophy was to work with Tiburón's inherent beauty. In keeping with his aggressive playing philosophy, Norman has designed the Tiburón courses to challenge skills, sharpen ability, and instill an even deeper respect for the legends the game has created. Hosted by Tiburón Golf Club in November, the Franklin Templeton Shootout includes an elite field of 24 PGA Tour professionals who compete for a purse in excess of $2 million. Previously known as the Shark Shootout, this PGA Tour sanctioned event was founded by Greg Norman and his wife, Laura, in 1989 for the benefit of children's charities. 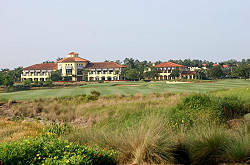 Tiburón is conveniently located adjacent to the new Ritz Carlton Lodge for a truly world-class golfing experience.